Warning: This article is based on peer-reviewed scientific research. Science deniers may want to read elsewhere. A new study by US scientists shows that as many of 16% of hydraulically fractured oil and gas wells spill liquids every year. According to the study, there were at least 6,648 liquid releases from these wells over a ten-year period from 2005-14 in just four states — North Dakota, Colorado, Pennsylvania and New Mexico. This number is much higher than in a 2015 EPA study, which found only 457 spills in eight states during the period 2006-12. The study, “Unconventional Oil and Gas Spills: Risks, Mitigation Priorities, and State Reporting Requirements,” was published in Environmental Science and Technology on February 21, 2017. Tanks used to temporarily store wastewater and crude oil. Flowlines that carry fluids from the wellhead to and between equipment such as tanks, blenders, pits, and injection wells. Stuffing Boxes are devices that prevent leakage at the wellhead from valves, pistons, etc. Wellhead spills occur at the point where oil is extracted from the ground due to faulty valves, blowout preventers, separators and other wellhead equipment. The data recorded 4,453 incidents in North Dakota, much higher than Pennsylvania, Colorado and New Mexico. Part of this is due to reporting requirements. In North Dakota, any spill larger than 42 gallons has to be reported, while in Colorado and New Mexico the requirement was 210 gallons. As you can see from the chart at right, the largest number of spills occur in the first years of operation, with a rate as high as 15-16%. This number is reduced over time, although it settles at 7-9% over many years of operation. 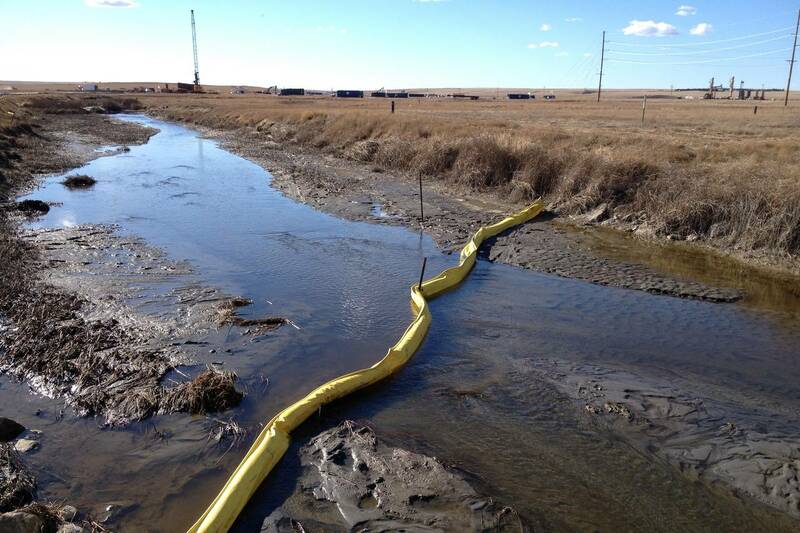 Over half of spills in North Dakota occurred at wells that had recorded a previous incident. Industry lobbyists dispute the data, of course. “The reality is that North Dakota requires that companies report any spills that are a barrel or more, even if they never impact the environment – and the vast majority of spills have not,” said Katie Brown from Energy in Depth, a body funded by petroleum producing companies. 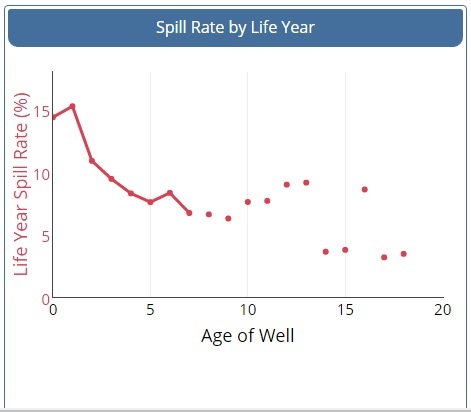 Even if you accept the industry data, simple math says that 30% of the spills are not contained on the pad. That’s over 1300 spills in North Dakota alone during the period studied. In a fragile ecosystem highly dependent on concentrated sources of water like the Beartooth Front, this data is highly alarming. It argues for local regulation that protects water, air, and soil required for agriculture and ranching. That is why residents continue to work with County Commissioners on local ordinances in Carbon and Stillwater counties. This entry was posted in Fracking Information and tagged Environmental Science and Technology, local regulation, oil spills. Bookmark the permalink. If it was peer-reviewed it must be a Chinese plot. This is a great line: *Warning:*/This article is based on peer-reviewed scientific research./ Science deniers may want to read elsewhere. Thanks. When climate denial becomes the official policy of the federal government, it’s important to make the distinction. Today Senator Steve Daines gave a speech to the Montana legislature. He touted the virtues of pipelines as the most environmentally safe way to ferry fossil fuels. He wants to save and reinvigorate Big Coal. His ‘thinking’ is forceful, and in spite of what he boasts about listening to constituents, he thinks his thinking is unassailable. Now with Republicans in charge of everything, he’s determined to march backward into the 20th Century. Daines is paid by the oil and gas industry to be a climate denier. He is the most regressive force in Montana.